Articulo – Journal of Urban Research celebrates its 10th anniversary! To celebrate this milestone, the current editors discuss the numerous changes and challenges related to publishing a peer-reviewed online journal. Since 2005, Articulo has progressively become more international, more professional, and more specialized than its initiators ever dreamed it could be. In ten years, the rather confidential publication has progressively become a journal read by 9,000 people every month. Our editors, who used to work side by side, now live 6,000 km apart. In the midst of often tumultuous change, what hasn’t changed is our commitment to the highest quality of publication and our conviction that knowledge – especially if funded by public money – should be universally and freely accessible. Rigorous peer-review and open access are the two principles on which the journal will navigate the often rough seas of online publishing in the future. 1This year marks the 10th anniversary of the creation of Articulo – Journal of Urban Research. To celebrate this milestone, the current editors have temporarily set aside some of their pressing research and teaching activities to discuss the numerous changes and challenges related to publishing a peer-reviewed online journal. To be perfectly clear to our readers and to the authors who went through our merciless evaluation process: just once, this is not a peer-reviewed article and our only aim is to reflect on the accomplishments of the journal over the past ten years and the challenges that lie ahead. These experiences and reflections will be of interest to our readership, but also to other aspiring online and open-access journals. 2To be honest, it feels like no time has passed since the idea of creating an online journal was launched in 2004 in a tiny office of the Institute of Geography at the University of Lausanne. The ambition at the time was to create a critical, cross-cutting publication, capable of overcoming the potential weaknesses of ever-more-specialized intellectual work that was creating a risk of fragmented fields of knowledge. To fight against what John Stuart Mill have called a cult of “narrow specialisation”, we wanted to offer a platform capable of promoting an “oblique” view of society, far different from an interdisciplinary approach, which often struck us as just another way of expressing “disciplinary patriotism”. In short, we wished to transcend disciplines. We wanted to be a post-disciplinary phenomenon. Incidentally, one of the original principles was not to select proposed articles on the basis of a predetermined range of concerns; rather, the main selection criterion was to be their capacity to provoke reflection on daily life as a total social fact, to use Marcel Mauss’ language. Based on that logic, the first three issues entitled Plural Perspectives on Daily Activities, Social Dimensions of Economy and Avant-gardists and Elites appeared under the title Articulo – revue post-disciplinaire (a post-disciplinary journal). 3As the publication entered production, it became apparent, however, that our post-disciplinary project would encounter unanticipated challenges. First of all, it was hard to explain the post-disciplinary principle to the experts whom we asked to peer-review our articles. Secondly, apart from one sociologist, all of the founders were geographers. What Freud might have called “disciplinary repression” soon became apparent in our requests for the proposed themes. So Articulo changed its subtitle to revue de sciences humaines or journal of human sciences. Our requests for articles began to focus more narrowly on subjects with a spatial dimension: A Cultural and Political Geography of Tourism; Peri-urban Splendor and Misery; Changing European Borders; Occupying, Organising and Ordering Urban Space; and Urban Landscaping Aesthetics and Practices. 4As a result of this new focus, in the course of 2010, Articulo officially recognized that it was to be rooted in urban-related themes, and thus became Articulo – Journal of Urban Research. This adjustment became apparent through a still more finely-tuned focus in the journal’s thematic issues: Tiring Mobilities; Gated Communities; Geography of Finance and Real Estate; New Landscape Narrative; and Revisiting Urbanity and Rurality. Today, the journal very clearly falls within the field of urban studies, permitting a relative consistency with some of its original principles, especially the desire to guard against the cult of narrow specialization mentioned in the introduction. The goal is now to question urbanity as a total social fact, a space in which contemporary transformations of the socius can be documented, reflected on and analyzed. 5Since the official launch of the journal in 2005, the journal born of the enthusiasm of a few doctoral and post-doctoral students has tempered its anarchistic fervor. Aging wisely also means gaining temperance without renouncing one’s principles. Although we no longer strive to be “post-disciplinary” or simply “a-disciplinary”, broad-ranging reflection is still the objective, as shown by the diversity of the themes in the upcoming issues: City-Making; Urban Night; Suburbia; Inconspicuous Globalisation, or Ecourbanism Worldwide. 6As the journal’s subject matter became more narrowly specified, it gained in recognition and readership. Soon after we decided to explicitly classify the journal in a specific field, it was recognized by the French Evaluation Agency for Research and Higher Education (AERES) and then indexed in Elsevier’s Scopus database, which covers high-ranking peer-reviewed journals in the technical, medical and social sciences. Our choice to combine that explicit classification in a field of scientific research with a gradual transition towards English as the sole language of communication is partly due to our desire to increase the readership and recognition of the journal by taking advantage of the current changes underway in the field of scientific publications. As the next sections show, this was far from easy. 7Our first challenge was to develop an online journal in an environment characterized by significant changes to the dissemination of knowledge as a result of the development of the Internet and the increasing number of scholars. This evolution has manifested in two major evolutionary developments: the transition from paper to web content and an increase in scholarly publications. Articulo embodies this evolution. From its inception, its editors made the deliberate decision to publish uniquely online and in an open access format. These choices had numerous advantages for a young publication, including limiting overhead and general costs. However, these decisions were also consistent with the editorial philosophy of the journal. First, access to articles should be free and uninhibited by the barrier of distance. Publishing online permits the journal to reach the widest possible readership – an Internet connection is all it takes to access all of its content. Secondly, the editors believe that knowledge should be disseminated free from the long delays typical of the editorial process of paper based publications. 8However, this model of publication also presents several drawbacks and requires the implementation of quality control measures. The free availability of scholarly resources has led to the multiplication of sources, increasing dispersal and a notable heterogeneity of article quality. From self-publishing sites, to university blogs and predatory journals that charge authors for publishing their work (see Beall 2015, Berger and Cirasella 2015), to respectable peer reviewed academic journals, the reader can be disoriented by this abundance of sources and face difficulties in parsing them all. Additionally, the recent ascendance of academic social network sites such as academia.edu, ResearchGate and Faculty Row contributes to the duplication and dispersal of sources through their self-archiving and publication function. 9Several portals or content aggregators have emerged to more effectively navigate this new landscape of online publication, including Repec, Google Scholar, Web of Science, Scopus, Cairn, Erudit and Revues.org. Using these portals, readers can distinguish between several types of resources by whether they are public of private, free or pay walled, generalist or specialized, and peer-reviewed (or not) publications. The Revues.org portal that hosts our journal is consistent with the core philosophy of our journal. Supported by the French state and other public institutions, Revues.org only hosts publications that are peer-reviewed and freely accessible and provides metadata and Digital Object Identifiers (DOI) for hosted articles. Almost 400 publications were available through Revues.org in May 2015, which also provides free training and technical assistance to the editors, a professional online production tracking website (Manuscrits), and a robust electronic-publishing software (Lodel) with regular back-up. Without the unconditional support of Revues.org and its staff, it is quite safe to say that we would not be where we are today. In this sense, Revues.org differentiates itself from the big commercial portals whose practice of charging for downloads has been repeatedly denounced in Europe and North America (Harvard Libary 2012, Langlais and Stamboliyska 2014, University of Montreal Library 2014). A protest movement against traditional journal dissemination faces several key challenges in its attempt to reform academic publishing. 10The first big challenge is in mobilizing and, most crucially, funding the human resources needed to assemble serious academic publishing (Pumain 2011). Journal funding can be hard to come by and a balance must be struck between funding online infrastructure, such as Revues.org, editorial functions provided by the largely volunteer academic community, and the costs of subscriptions. The second big challenge is the development of quality measures independent from the large commercial publishers. For example, of the journals listed in the field of transportation in the Thompson Reuters Journal Citation Report only one, the European Journal of Transport and Infrastructure Research (published by the Delft University of Technology) is freely accessible. 11Low cost online publication appears to be the future of academic knowledge dissemination. In addition to the practical difficulties of editing, compiling, evaluating and tracking publications it is essential to encourage a change of practices and conventions within the academic community itself as it is ultimately researchers who are the core actors in the landscape of academic publishing. 12Another challenge faced by our journal was to be able to diversify the geographical and linguistic origin of our readers and increase total visits to our website. Without necessarily reaching 57 million unique visitors per month like the New York Times, our ambition was to be read by an increasing number of people interested in urban studies, anywhere, at any time. Achieving this objective has been tortuous. On the one hand, the number of unique visitors to the website has increased significantly since our journal joined its new electronic portal Revues.org in 2008. On the other hand, our readership has long been dominated by French speakers and it is only recently that we are beginning to have a truly global audience. 13The first data on user numbers provided by Revues.org in March 2009 indicated that our website was visited by 3,250 unique visitors. Six years later, our monthly visitor rate has almost tripled to more than 9,000 unique visitors. As Figure 1 shows, the growth in page views has been quite uneven over the last years. Seasonality is a crucial issue in online publishing: winter is the season that attracts the most visitors, and November has systematically been the busiest month on our website, while the number of visitors declines sharply during the summer holidays, particularly in July. 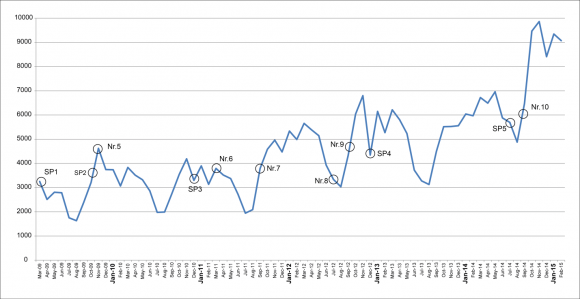 This seasonality is accentuated by the fact that most of our issues have been published during the first or the last months of the year. 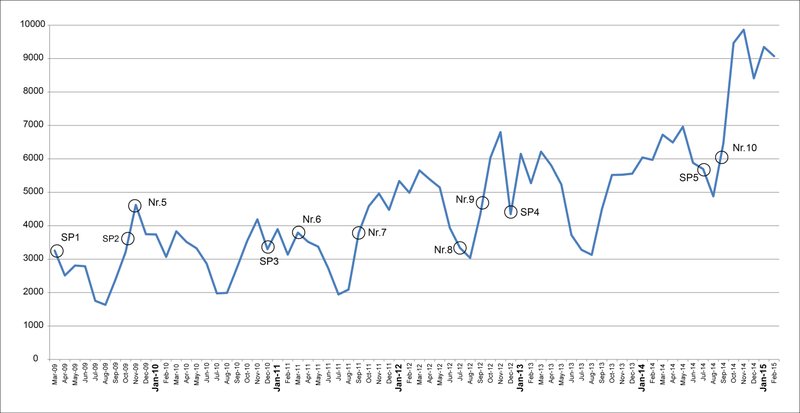 As can be seen from Figure 1, publishing a special issue in the summer, as our issue 5/2014, did not affect the seasonal decline of our article views. Source: Revues.org. Note: regular issues are indicated with Nr. and special issues with SP. 14The number of visits to the website is stable from Monday to Thursday. It often decreases on Saturdays, before climbing back up on Sundays. More visitors read our articles between 11-12am and 3-4pm (GMT+1) than during any other period of the day. The peak is particularly marked between 3pm and 4 pm (GMT+1) which corresponds to the end of the business day in Western Europe and to the beginning of the business day in North America, our two main sources of readers. Our busiest day ever was Thursday 19 February 2015, with 782 unique visits. 15Our readership has long been dominated by visitors from France and from countries with a large French-speaking population such as Luxembourg, Switzerland, Belgium and Canada (Figure 2). This, of course, reflects the origins of the journal, created in a French-speaking environment in Switzerland. Until mid-2012, it is fair to say that our journal was principally read by Francophone readers, who typically represented more than 40% of our readers. At that time, our authors predominantly published in French. The 9/2012 issue was the first to have been published in English only. 16Since then, our efforts to publish in English and to recruit new editors from North America seem to have been paying off. The proportion of visitors from France has been cut in half from November 2011 (60%) to September 2014 (29%). It experienced a temporary increase at the end of the year 2013 before diminishing again and reaching an historic low of 27% in July 2014. The journal now attracts a more international audience, composed of a larger number of non-French speaking countries. About 30% of our web pages are viewed today by readers living in the United States and the United Kingdom. As the number of articles in English increases on our website, the proportion of non-Francophone visitors is likely to increase too in the next years. 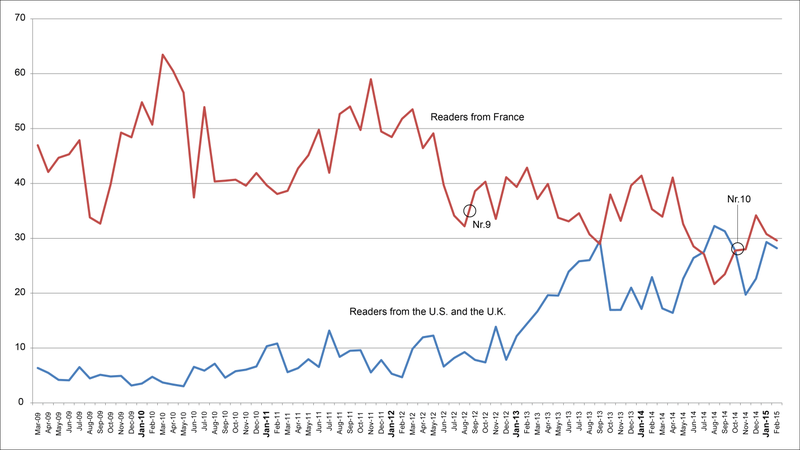 The effect of publishing issues in English-only is however not as immediate as one could think: as can be seen from Figure 2, the two first issues exclusively in English (Nr. 9 and Nr. 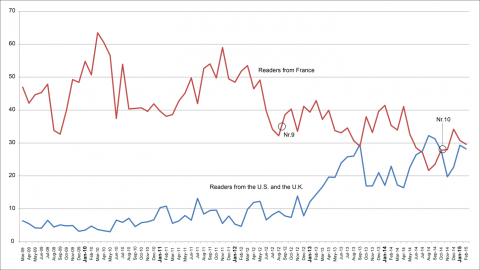 10) have only contributed to an increase of U.S. and U.K.-based readers on a long-term basis. 17Over the last 10 years, our journal has published just under 200 manuscripts, including 140 articles, 20 briefings and 35 book reviews. As shown in Figure 3, the number of articles published was low until we joined the online portal Revues.org in 2008 and quite irregular until our journal was indexed by the SCOPUS database in 2013. Since then, the objective of the editorial board has been to publish a minimum of two regular issues per year and increase the number of briefings and book reviews. Five new issues dealing with a variety of urban issues will appear before the beginning of the year 2016. 18A small number of papers – listed on Table 1 – attract a disproportional number of visitors. 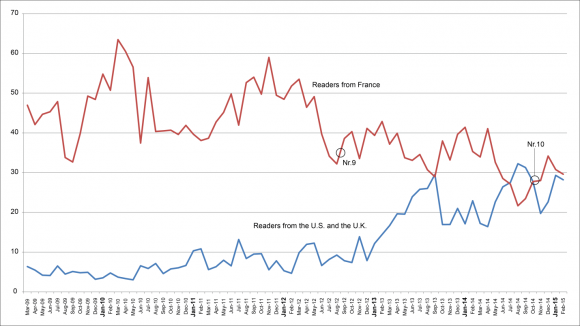 The five most read papers between January 2006 and February 2015 were all written in French. This is not really surprising, considering that these articles were among the first to be published and have been available to readers longer than more recent papers in English. With more than 25,000 views, the analysis of daily mobility and residential base by Editor Samuel Carpentier is, by far, the most popular piece ever published by the journal. Martin’s article on the French geographer Henri Lefebvre and Bonard and Felli’s article dealing with urban tourism in Lyon and Beijing are also among the favorites with more than 10,000 views. Among the most read papers were viewed last year (2014-2015) when a number of papers written in English started to appear. They include An Analysis of Cross-Border Intermunicipal Relations in the Detroit-Windsor Region, by Briefings Editor Jen Nelles (3,164 views), Popular Literature Discourses in Athenian Suburbia, by Irene Theodoropoulou (2,713), and Flood Experiences and Human Vulnerability in Accra, Ghana, a briefing by Dacosta Aboagye (2,651 views). 19In sum, our journal has experienced steady growth in the number of online readers over the last 10 years. Given these trends we expect more than 10,000 unique visitors to visit our website this year. These encouraging figures remain, however, modest compared with other social sciences journals hosted by Revues.org for which comparable readership data is available. For example, Cybergeo, the European Journal of Geography, had more than 55,000 unique visitors in February 2015, more than five times our rates. The journals Echogeo (33,000 visitors) published in Paris, L’Espace Politique (22,000 visitors) published at the University of Reims, or Géocarrefour (20,000 visitors) published in Lyon, also have a higher monthly online visitors than ours, which suggests a significant potential of growth. 20Our strategy for the future is to encourage the growth of our readership by increasing the number of articles available online and their quality. Because we are an online journal only, there is no doubt that the number of our readers depends on the number of articles available on the internet: more web pages mean more potential readers. Almost 95% of our readers find us using Google whereas links from external pages such as Facebook, LinkedIn, Twitter, university libraries, or other websites contribute to a marginal share of our visits. In addition to increasing the number and quality of published articles, we aim at increasing the international audience of the journal. The recent evolution of our website indicates that this strategy seems to be bearing fruit. Our readership has become less Francophone and all our regular issues are now published in English. This strategic move resulted both from our wish to strengthen the international recognition of the journal, and was a prerequisite to be indexed by the bibliographic databases of scientific journal of the world. 21Our journal contains a briefings section that was developed to serve as a forum for emerging scholars from which to disseminate and solicit feedback on early stage research. The section is conceptualized to present short, topical and informative texts about current developments in urban and regional research, policy and advocacy. The maximum length for Briefings is 2,000 words. We encourage submissions from both academics and practitioners on urban issues around the world. These briefings are meant to inform readers about recent and significant developments in the field of urban studies or in urban policy, raise interesting questions and provoke debate. 22Among the advantages of publishing in this section are shorter turnaround times for peer review, open access, and increased flexibility of content due to the fact that Briefings are published independently from themed issues. However, despite these advantages Articulo receives very few Briefings submissions per cycle. While this is perhaps related to deficiencies in our article solicitation process there are also some real challenges to encouraging the submission of short format research, in English, from an international audience. 23First and foremost, scholars of all stripes continue to be primarily evaluated – for tenure and promotion or for employment – by the number and quality of their full length scholarly contributions (see Hodge and Lacasse 2011). This is often felt particularly acutely by early stage researchers eager to build their curriculum vitae in a competitive job market. While an Articulo Briefing offers the same level of peer review scrutiny as a full-length submission it appears as though many scholars prefer to expend similar effort to publish full-length articles. 24A second difficulty in acquiring short format submissions is that they are often harder to write. For academics – early stage or otherwise – steeped in a tradition of 20-30 page papers it can be very difficult to pare findings down to less than 2,000 words. Conference papers are an excellent example of this phenomenon. In conference settings word limits are often looser, or nonexistent, and final submissions (even the late ones) can seldom be described as concise. Or consider the last time that an editor accepted an article if only you could cut 1,000 words. Shortening a research article is perhaps the most difficult and daunting editing task that an academic can undertake. As S*** Academics Say recently argued on Twitter, “People will forget what you said, people will forget what you did, but they will never forget how you made them cut their manuscript by 30%”. This is perhaps even truer for graduate students deep in the process of writing a monograph length thesis. 25Given the opportunity, we reckon that many of us would all relish more space rather than rejoicing at having to write less. It was hoped that scholars would approach the Briefings section as a different form of writing – somewhere between a blog post and a full-length piece – in which new ideas could be teased, new research could be tested and where scholars could respond nimbly to current events. However, all of the submissions received to date have been obviously shortened versions of longer projects not specifically conceptualized for the format. 26This lack of attention to the different approach required to short format writing has been the downfall of many of the submissions that the journal has received for two main reasons: First, articles that have simply been shortened, rather than written explicitly with a short format in mind, are not as powerfully argued. These often fail at the peer review stage and resubmission rates have been low for revise and resubmit decisions. Secondly, scholars have occasionally attempted to submit chopped down, and not substantially altered, versions of work already published elsewhere. These are rejected even before the peer review stage as ethically inappropriate and not in keeping with the spirit of the section – to provide a platform for new and compelling research. 27Finally, some very interesting submissions have been rejected on the basis of poor quality prose or English translation. Articulo is a journal with an international audience and articles have been solicited from and submitted by scholars from very diverse backgrounds. While this is an asset in terms of substance it is also clear that many authors struggle to produce writing of sufficient quality to send out for peer review in the English language. For a large proportion of submissions authors have been asked to resubmit promising research after a thorough review by a professional translator or native English speaker. Very few actually do so, most likely because of the costs involved in engaging professional translation help are high as is the uncertainty about whether the article will pass peer review and thereby justify the expense. While this challenge is not unique to short format research the potentially lower payoff to publishing in this format may discourage international submissions in greater numbers. 28Short of completely changing the conceptualization of the Briefings format the most productive way to encourage greater numbers of higher quality short-format submissions are to raise the profile of the Briefings section; provide better examples of successful Briefings; and better disseminate published articles via social media. These two remedies are closely intertwined and involved concerted effort on behalf of the section editor. The first is based on the premise that scholars are eager to publish in a higher profile format. That the section has, so far, been marketed to junior and early career scholars has resulted in few publications that have had international appeal – both in terms of topic and “name recognition”. 29One solution is to more aggressively seek out the work of senior scholars whose work will attract readers and help to spread the word about the Briefings format. In order to ensure that early stage researchers work is not excluded editors might consider a “twinned” approach whereby a senior scholar selects a topic and provides a summary of the state of the discipline/area and chooses a junior scholar (graduate student, post doc or early stage faculty) partner to comment and describe how their research contributes to advances in the field. A selection of these paired dialogues might encourage more submissions as senior scholars and their junior counterparts may attract more readers. The reimagined format would also reduce the number of simply “chopped” submissions. 30While the twinned format could comprise some of the Briefings publications the journal might still consider traditional submissions. In that case the editorial board members should be leveraged to each write a piece of their own to provide some better examples of what a successful submission might look like in terms of content, argumentation and organization. The jumble of publications to date does an inconsistent job of showing the potential of the section. Clear examples paired with clearer publication guidelines may help to increase the quality of the work submitted. 31Short format publications face steep challenges in gaining the recognition of and, most crucially, fighting for the limited writing time of the modern academic. However, some of the strategies discussed here may help raise the profile of this format in general, and for Articulo in particular. 32Articulo adopted a formal book review section with a dedicated manager in 2012. Like other scientific journals, our aim was to provide a forum to discuss and share ideas on urban studies and academic research, but also information about publications. The reviews cover the different fields of urban studies, including urban planning, architecture, urban sociology, economic and social geography, and urban anthropology. 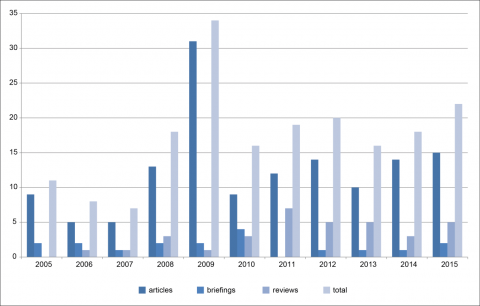 The review section publishes half a dozen reviews, on average, per year. 33Critical reviews of significant books written by experts are the regular features. At the request of the book review editor, they are encouraged to develop critical and scientific advices on the scope of a document that is of interest for our readers. The decision to publish the review is based on both the scientific value of the review and ethical criteria. These critical reports participate in interdisciplinary dialogues and debates on current research. In this regard, Articulo book reviews are between 1,500 and 2,000 words; longer than those in other comparable journals. 34The book reviews provide a wealth of information that is useful, practical, and especially analytical. These reviews can also relate to other reviews available in the scientific and academic spaces. It is also important that the book reviews be quite numerous and varied to attract a broad readership, and keep curiosity and expectations high for repeated visitors. 35In the past, we have faced, however, times in which it was difficult to recruit reviewers for this section. A compelling book review does not acquire formal recognition, especially in comparison to regular articles. The time for book reading and critical review writing is precious, and the recognition of a book review as being a valued ‘product’ in the world of research is uncertain. Here, graduate students may be a valuable source of contributing to this section. Also, regular Articulo thematic issues compiled by specialists, specific seminars and/or thematic schools could lead to a series of reviews on different books within a related thematic setting. Grouping books on similar topics and treating them all in one review could add value to the interested readership of our journal. The same may hold true for bundling reviews from different reviewers on the same book. 36Why does an online journal like Articulo need to invest time and resources in offering “classical” book reviews in 2015? Our intention is simply to inform our readers about the main areas of interest in cutting edge theoretical and empirical research within the vastly growing numbers of book publications in this broad field of urban research. Here, with a view to creating an improved space for sharing and exchanging ideas on urban research, it is relevant to think differently about this section. Which format would best accomplish our goals in an online journal? Models and ideas developed in social networks seem relevant tracks to explore – with interactive pages, forums, and others blog discussion or co-creation processes. Without losing the idea of giving value to the product of our book reviews section, the idea of sharing, exchanging, and, perhaps more interestingly, interacting seems essential in the current and future world of scientific publication. 37In 2013, our journal got accepted into the illustrious circle of professional journals in the field of urban studies. Articulo’s successful ranking with Scopus has brought both new opportunities and new challenges: our journal now enjoys greater visibility as a potential platform to publish good quality research with open access, and scholars consider publishing their work with us more often than before. Yet, we find ourselves in a new environment of competition that needs to be carefully approached and mastered. We have put much effort into developing Articulo’s style and a unique combination of factors that are the journal’s main selling points. We, the editors, are convinced that this will position our journal successfully among our competitors; and we are determined to make a difference for the articles published with us by our fellow scholars. 38A huge strength is, first of all, our financial and intellectual freedom. We operate fully independently from any of the large publishing houses. Since March 2011, Articulo has been subject to a new ‘freemium’ model in which the pdfs of the published articles can be purchased for 2 euros each, while the continuous text remains freely accessible online. Although this is not an exuberant price, the increased number of article downloads have helped to grow our overall budget significantly. Our independence, however, gives us both the freedom to work on a non-commercial basis and the flexibility to try out new formats and to adapt to new technological developments. 39Openness, a second core strength, clearly allows us to embrace not only a multidisciplinary perspective on transformative dynamics of social, environmental and economic issues in urban settings, but also provides an appropriate platform for discussing such novel ideas and projects even in their early stages. Both our Briefings and our Book Reviews sections add to strengthen our broad thematic focus. 40The third strength – the frequent publication of thematic or special issues – encourages our audiences to actively engage with and critically reflect on a specific theme from a range of different angles and standpoints and certainly in more depth. Not least in this regard, we expect that Articulo’s international ranking adds further weight to published articles that explore innovative ideas and topical issues that possibly build towards original perspectives within the broad field of urban studies. 41A fourth strength is the comparably short time to online publication and the associated open access to our published articles. For years, Articulo has been at the forefront of open access publishing. As a fully-operating online journal we are dedicated to allow a prompt publication process after a rigorous review process to our readership and authors. 42Combining all these strengths defines our unique selling point: We are well-equipped to publish thought-provoking pieces in both established and new formats as well as from both established and young scholars. 43Articulo is currently experiencing a transition from French-language article submissions towards an increased number of paper submissions and guest editorial enquiries in English. We certainly hope that facilitating more English-speaking publications will increase Articulo’s international visibility because conventional search engines and research platforms still primarily operate with the English language, although there are tendencies to integrate further large publication communities with other languages. 44Our long-term goal is to position our journal among some of the most prestigious journals in the broad field of urban studies, and, hence, to improve its ranking scores. A higher ranking would obviously correlate with better recognition of Articulo as an online publication platform of international reach. We would expect that such a development would raise our chances to successfully campaign for further external funding for the journal, which Articulo as an independent journal still relies on. 45With all these assets, we do believe that we are well equipped to meet the challenges waiting in the near future. They include, among other, the current wave of established journal cautiously promoting open access and a more visible positioning of Articulo among these journals, our perceived competitors. Although, this process requires time, ‘publish or perish’ is not the question for Articulo anymore. We have successfully managed to outgrow this first phase after establishing the journal ten years ago. Rather, we aim at publishing state-of-the-art articles more frequently. 46Since 2005, Articulo has progressively become more international, more professional, and more specialized than its initiators ever dreamed it could be. In ten years, the rather confidential publication has progressively become a journal read by 9,000 people every month. Our editors, who used to work side by side, now live 6,000 km apart. In the midst of often tumultuous change, what hasn’t changed is our commitment to the highest quality of publication and our conviction that knowledge – especially if funded by public money – should be universally and freely accessible. Rigorous peer-review and open access are the two principles on which the journal will navigate the often rough seas of online publishing in the future. Beall J. 2015. Beall’s List: Potential, possible, or probable predatory scholarly open-access publishers. Scholarly Open Access, http://scholarlyoa.com/publishers/ (retrieved May 29, 2015). Berger M, Cirasella J. 2015. Beyond Beall’s List: We need a better understanding of predatory publishing without overstating its size and danger. London School of Economics and Political Science, The Impact Blog, http://blogs.lse.ac.uk/impactofsocialsciences/2015/03/18/beyond-bealls-list-predatory-publishers/ (retrieved May 29, 2015). Harvard Libary. 2012. Faculty Advisory Council Memorandum on Journal Pricing. Major Periodical Subscriptions Cannot Be Sustained. Cambridge, Harvard University, April 17. Hodge DR, Lacasse JR. 2011. 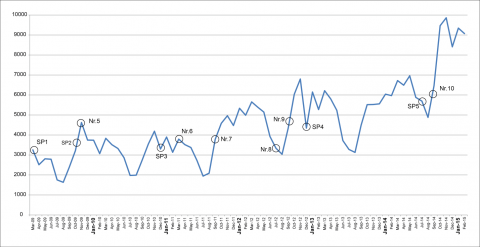 Ranking disciplinary journals with the Google Scholar H-Index: A new tool for constructing cases for tenure, promotion, and other professional decisions. Journal of Social Work Education 47(3): 579-596. Langlais P.-C, Stamboliyska R. 2014. La France préfère payer (deux fois) pour les articles de ses chercheurs. L’Obs and Rue89, 10 November, http://rue89.nouvelobs.com/2014/11/10/france-prefere-payer-deux-fois-les-articles-chercheurs-255964 (retrieved May 29, 2015). Pumain D. 2011. The price of freedom. Cybergeo: European Journal of Geography http://cybergeo.revues.org/23628 (retrieved May 29, 2015). University of Montreal Library. 2014. Annulation d’abonnements à la majorité des périodiques de la collection Wiley Online Library. Montreal, University of Montreal, January 14. Book review of: Lyndsay Waters. L’éclipse du savoir. Book review of: Christophers B. 2013. Banking across Boundaries: Placing Finance in Capitalism. Malden, Wiley-Blackwell. Compte rendu: Groupe Genève, 500 mètres de ville en plus, 2013. Genève, projet pour une métropole transfrontalière. Lausanne, L’Âge d’homme.